Ofcourse we dont want chapped lips.We all want our lips soft and succulent.Soft lips makes lipsticks and lipglosses look better.If you want cracked lips gone,just keep reading on how to make a lip scrub all by yourself. (You should scrub your lips at least once every week). 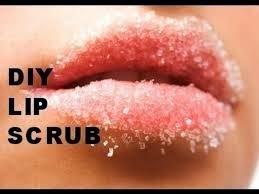 Add about two teaspoon of sugar in a little plastic with a lid,add half teaspoon of olive oil and honey.Mix them together.The sugar exfoliates the lips and the honey mosturizes it.Use your finger to apply a little bit on your lips and scrub for about a minute(not too hard).Remove the mixture with wipes or a wet towel and thats all.